SWALIM's work on land resources in Somalia has focused on assessing the characteristics of the land, the activities carried out on it and the subsequent effects of these activities. 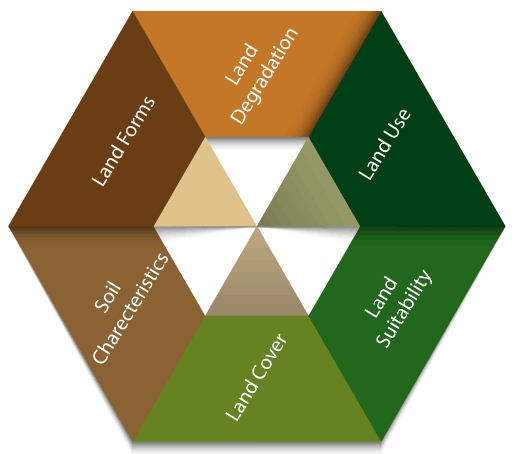 Topics covered include land forms, land cover, land use, soil characteristics, land suitability and land degradation, among others. A combination of tools has been used, including Remote Sensin g (RS), Geographic Information Systems (GIS) and Global Positioning Systems (GPS), in addition to field surveys, to collect and process data on land resources. These tools produce “rich” maps with legends that describe the different features of the maps. Based on these outputs, numerous studies and guidelines have been published on the state and use of land in Somalia. A wide variety of studies and reports can be found in our publications library under Information Management.The studies are at different detail levels - national and various areas of interest. SWALIM studies show that the quality of the land in the country has been deteriorating as a result of intensive use and rampant mismanagement over many years. Land degradation (understood as a reduction in the capacity of the land to perform the functions and services of a healthy eco-system) has accelerated since the collapse of central government, due mainly to the lack of good land use governance and practice. The resultant poor land quality has compromised crop and livestock production, contributing to perpetual food insecurity, low incomes and widespread poverty.